© Saad Al-Almaie; Licensee Bentham Open. 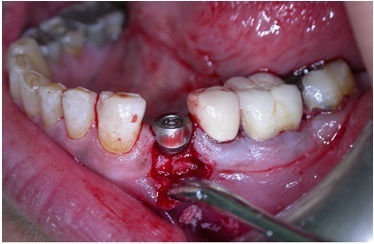 This clinical case describes the effect of the osteotome technique on the osseointegration of a mandibular dental implant in a 42-year-old female patient with dento-alveolar bony defects and to review the literature regarding immediate implant placement using osteotome technique. The amount of bone expansion at the alveolar ridge and the marginal bone resorption from the time of implant placement to one year after the implant’s functional loading were recorded clinically. The esthetic outcome for the restored implant (the gingival margin) was achieved one years after the implant’s functional loading. The surgical and prosthetic sites for the implant showed no postoperative complications, and no infection or wound dehiscence was recorded during the follow-up period. The osteotome technique is good for the purpose for which it was introduced, and its advantages with immediate implant placement include reduced surgical trauma and a shorter treatment time. Keywords: Bone density, Bone resorption, Implant stability, Osteotome technique, Ridge defect, Ridge expansion. 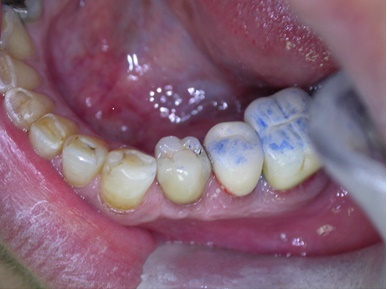 Dento-alveolar bony defects are very common and pose a significant problem in dental treatment and rehabilitation. Reconstruction of dento-alveolar bony defects using minimally invasive techniques would greatly enhance the success and patient acceptance of this area of reconstructive surgery. Over the past three decades, great strides have been made in the field of alveolar bone preservation and augmentation. Reviews of the literature identify many techniques and materials that have been used successfully to obtain esthetically and functionally acceptable alveolar ridge for successful implant [1, 2]. The alveolar ridge revealing knife-edge morphology or non space-maintaining defects usually require a local alveolar ridge expansion procedure. In such situations the ridge may be expanded by splitting  or spreading [4, 5] of the bone, resulting in a sufficient width for implant bed preparation. Reviews of literatures concluded that the osteotome technique is good for the purpose for which it was introduced, that is, for knife-edge ridges, and it should not be considered a substitute for conventional procedures for implant placement [6-8]. The osteotome set consists of matched and tapered hand instruments which create implant sites by widening the ridge and condensing the bone in lateral and apical directions. The tapered osteotomes allow for minimal heat generation, greater tactile sensitivity, faster and larger bone apposition by compressing the bone laterally and thus creating a denser interface for the implant to be placed [9-11]. Alveolar ridge defects are classified according to their three-dimensional morphology form, severity, and extent . Various bone augmentation techniques have been employed to reconstruct these different ridge defects. The predictability of the augmentation procedures depend on the horizontal and vertical extents of the defect . This clinical case describes the effect of the osteotome technique on the osseointegration mandibular dental implants placement in a 42-year-old female patient with dento-alveolar bony defects and defines management solutions in the event of existing bone resorption. PubMed databases were used to search for published articles about immediate implant placement using osteotome technique. Clinical studies and cases using osteotome technique with simultaneous implant placement were included. Letters to the Editor, historical reviews, cadaveric studies, and unpublished articles were not sought. Some articles were directly excluded after reading only their titles. All articles for maxillary sinus floor elevation using osteotome technique, immediate implant placement using osteotome technique with bone graft material, bone spreader technique, modified trephine/osteotome approach, and tapered implants were excluded. Thereafter further articles were excluded based on irrelevance. At this stage there were 28 articles included, and the inclusion and exclusion criteria were defined. Thirteen articles were included for full-text reading. After reading these, four more articles were excluded, as they did not fulfill the inclusion criteria. These articles were included in introduction and discussion in addition to that, more reviews of literature had been included regarding immediate implant placement using osteotome technique. A 42-year-old female patient with a noncontributory medical history presented for the replacement of a missing lower-left first premolar, which had been extracted 3 years earlier. 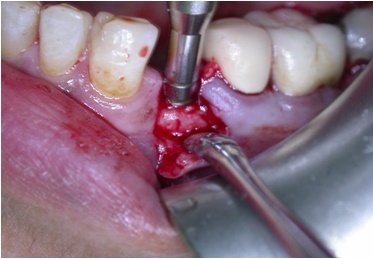 The patient offered to place a dental implant using lateral bone condensation and expansion via the osteotome technique because it required shorter surgical procedure, recovery time and did not require bone grafting. Clinical and Radiographic images were taken pre-operatively (Figs. 1-2). 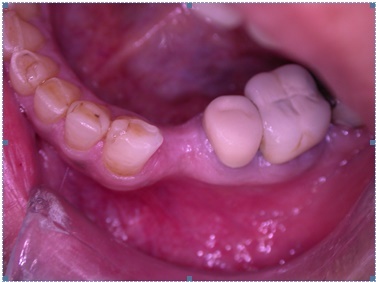 With the patient under local anesthesia, a full-thickness flap was elevated using a mid-crestal incision and 2 buccal and palatal incisions to release the lower-left first premolar. This revealed further bone concavity on the buccal aspect. The bone was accessed and marked with a round bur. Prior to the use of the osteotome technique; the bone quality was determined clinically by drilling with a 2.2-mm-diameter pilot twist drill to a depth of 11-12 mm to allow for complete insertion of the full length of the 10-mm implant plus 1 mm for bone remodeling. A depth gauge was used as distance indicator to determine the length of the preparation. Defect limited exclusively to the bucco-lingual direction with concavity due to bone loss. To improve the bone density and primary stability, bone condensation was attained through radial reinforcement using series of bone condensation devices with a tapered tip and an appropriate diameter 2.2 mm to 3.5 mm to widen the implant bed (ITI osteotome instruments for bone condensation, Institute Straumann, Basel, Switzerland). Extreme care was taken to proceed with the osteotome technique as slowly as possible. Because there was a degree of resistance, the ridge was allowed to spread for 30 to 60 seconds with the osteotome left in place before the next-size-larger osteotome was used (Fig. 3). After the final diameter of the implant bed was established and the crestal bone thickness reached 6.35 mm (Fig. 4), a 10-mm-long, 4.1-mm-diameter standard-neck, nonsubmerged sandblasted and acid-etched (SLA) screw-type ITI implant (Straumann Ch Company of Basel, Switzerland) was immediately placed after the bone expansion was completed and a healing abutment 2 mm in height was added (Fig. 5) Leaving the osteotomy slightly narrower than the diameter of the implant allowed the implant to self-tap and achieve good primary stability. 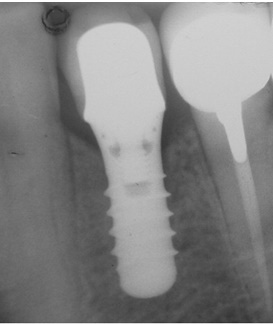 The implant position was visible on periapical radiograph immediately after implant insertion (Fig. 6). Six weeks postsurgery, the patient showed good soft-tissue healing (Fig. 7). The final impression was obtained following a healing period of 6 weeks after implant insertion. A prosthetic abutment was inserted with 35 Ncm of torque, and the reconstruction was issued (Fig. 8). 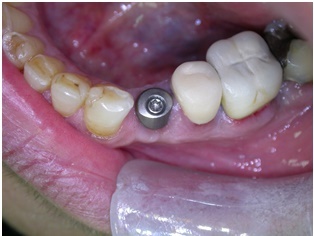 The implant was loaded and restored with a porcelain-metal retainer (Fig. 9). 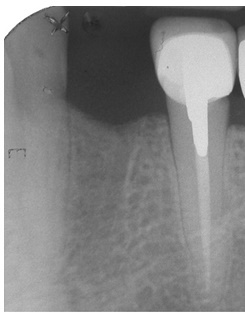 A radiograph taken at 12 months showed a stable clinical situation in the area around the apices of the implant (Fig. 10). During the follow-up period the implant successfully fulfilled the Buser et al. criteria . Ridge mapping for determination of alveolar ridge width showed crestal bone thicknesses of 3.2 and 6.35 mm before and after the osteotome technique, respectively, and 6.1 mm one year after the implant’s functional loading. The gingival margin for the restored implant one year after the implant’s functional loading was estimated using the gingival margin of adjacent teeth as reference points. Initial periapical radiograph of the case with normal ridge height. Osteotomy preparation with osteotome technique. The final diameter of the imlant bed was established and the crestal bone thickness reached 6.35 mm bucco-lingually. 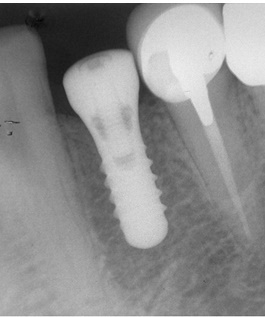 Implant in position with healing abutment 2 mm in height was placed at the implant installation. Periapical radiograph immediately after implant insertion. Intraloral view after 6 weeks of healing with good soft-tissue healing. Preiapical radiograph showing the implant and surrounding bone one year after the restoration and functional loading of the implant. The use of the osteotome technique has been investigated in clinical studies with emphasis given on the survival rate of the implants [15-20]. This is in accordance with Ernesto and Anitua , where they reported that previously complex sites having narrow buccolingual width that needed ridge augmentation prior to implant placement with the subsequent hazards of bone grafts and membranes, can be treated with one stage approach provided that adequate stability is achieved. A low speed, high torque hand piece was used in all of these cases during the cortical perforation only. The osteotomy site was then prepared with osteotomes eliminating the need for bone drilling with the possibility of overheating. Different studies showed an animal histologic study compared the osteotome technique to conventional implant placement with burs in 52 New Zealand white rabbits using 104 implants placed in the distal femoral condyles . Drilling removes bone. When adequate quantities of dense bone are available, this is not a problem. But when the alveolar bone is compromised in quality or quantity, the need is to preserve the remaining bone and improve its quality. This technique retains the total bone mass. It is an alternative to block grafting in select cases to increase the ridge width for implant placement. Allows immediate placement of implants in narrow ridges at the time of expansion. Osteotomes take advantage of the fact that bone is viscoelastic and can be compressed and manipulated. Compression creates a denser bony interface with increased bone to implant contact and therefore good initial stabilization of the dental implant. Heat is a major detriment to osseointegration, but the osteotome technique is an essentially heatless and therefore should not destroy the viable bone-forming cells. This technique also allows for greater tactile sensitivity. It is minimally invasive and cost effective. Faster prosthetic restoration is possible. The quality of bone with a dense cortical plate in this patient may also aided in providing the initial stability. In addition to thread engagement, body design and surface roughness help to provide a frictional interface with the receptor site, this inturn, will assist in mechanical retention by facilitating bone ingrowths during osseointegration . Numerous investigators have reported that SLA rough surfaces of the ITI implants, obtain a stronger bone anchorage when compared with smooth titanium surface and can also positively influence cellular and tissue responses to implants [28-34]. Due to the amount of bone resorption (dent-alveolar defect) for this clinical case we can figure out the importance of an atraumatic tooth extraction and immediate or early implant placement into extracted socket . Small and Tarnow found that recession occurred in most of the implant restorations during the first 3 months following abutment connection surgery. The majority of recession (80%) occurred on the buccal aspects with the mean recession of 0.9 mm and more pronounced in maxillary teeth . Koutouzis et al., reported case series where prospectively evaluated the clinical and radiographic outcome of immediately loaded implants placed with the osteotome technique over a 12-month period. Implants placed with the osteotome technique and immediately loaded did not demonstrate a high insertion torque and exhibited minimal marginal bone loss . 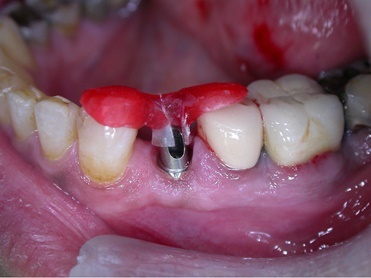 Donati et al., suggested that implants installed with a conventional installation techniques (conventional drilling procedure, or an osteotome technique) together with an immediate functional loading protocol may be considered as a valid treatment alternative in a long-term perspective when used in a single-tooth replacement in an esthetic area . The present case report indicates that immediate implant placement using osteotome technique is gentle; offers advantages for patients include less surgical trauma, a shorter treatment time, and reducing the need for costly procedures. This technique offers a viable alternative to bone grafting in select cases for lateral bone expansion where teeth have been missing for a considerable period of time. Further investigations including a large number of patients and considering long-term evaluation of peri-implant alveolar loss bone are necessary to enhance the power of the conclusions concerning use and predictability of osteotome technique. McAllister BS, Haghighat K. Bone augmentation techniques. J Periodontol 2007; 78(3): 377-96. Santagata M, Guariniello L, D’Andrea A, Tartaro GP. Single-tooth replacement in the esthetic zone with ridge expansion osteotomy: a clinical report and radiographic results. J Oral Implantol 2008; 34(4): 219-22. Engelke WG, Diederichs CG, Jacobs HG, Deckwer I. Alveolar reconstruction with splitting osteotomy and microfixation of implants. Int J Oral Maxillofac Implants 1997; 12(3): 310-8. Nishioka RS, Souza FA. Bone spreader technique: a preliminary 3-year study. J Oral Implantol 2009; 35(6): 289-94. Khairnar MS, Khairnar D, Bakshi K. Modified ridge splitting and bone expansion osteotomy for placement of dental implant in esthetic zone. Contemp Clin Dent 2014; 5(1): 110-4. Padmanabhan TV, Gupta RK. Comparison of crestal bone loss and implant stability among the implants placed with conventional procedure and using osteotome technique: a clinical study. J Oral Implantol 2010; 36(6): 475-83. Donati M, La Scala V, Di Raimondo R, Speroni S, Testi M, Berglundh T. Marginal bone preservation in single-tooth replacement: a 5-year prospective clinical multicenter study. Clin Implant Dent Relat Res 2015; 17(3): 425-34. Stavropoulos A, Nyengaard JR, Lang NP, Karring T. Immediate loading of single SLA implants: drilling vs. osteotomes for the preparation of the implant site. Clin Oral Implants Res 2008; 19(1): 55-65. Hahn J. Clinical uses of osteotomes. J Oral Implantol 1999; 25(1): 23-9. Summers RB. The osteotome technique: Part 4-Future site development. Compend Contin Educ Dent 1995; 16(11): 1090-2. Studer S, Naef R, Schärer P. Adjustment of localized alveolar ridge defects by soft tissue transplantation to improve mucogingival esthetics: a proposal for clinical classification and an evaluation of procedures. Quintessence Int 1997; 28(12): 785-805. Allen EP, Gainza CS, Farthing GG, Newbold DA. Improved technique for localized ridge augmentation. A report of 21 cases. J Periodontol 1985; 56(4): 195-9. Buser D, Weber HP, Brägger U. The treatment of partially edentulous patients with ITI hollow-screw implants: presurgical evaluation and surgical procedures. Int J Oral Maxillofac Implants 1990; 5(2): 165-75. Glauser G, Naef R, Schärer P. The osteotome technique a different method of implant placement in the posterior maxilla. Implantologie 1998; 2: 103-20. Komarnyckyj OG, London RM. Osteotome single-stage dental implant placement with and without sinus elevation: a clinical report. Int J Oral Maxillofac Implants 1998; 13(6): 799-804. Zitzmann NU, Schärer P. Sinus elevation procedures in the resorbed posterior maxilla. Comparison of the crestal and lateral approaches. Oral Surg Oral Med Oral Pathol Oral Radiol Endod 1998; 85(1): 8-17. 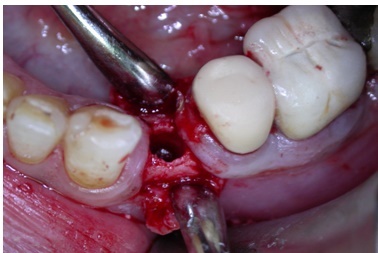 Fugazzotto PA. Sinus floor augmentation at the time of maxillary molar extraction: technique and report of preliminary results. Int J Oral Maxillofac Implants 1999; 14(4): 536-42. Rosen PS, Summers R, Mellado JR, et al. The bone-added osteotome sinus floor elevation technique: multicenter retrospective report of consecutively treated patients. Int J Oral Maxillofac Implants 1999; 14(6): 853-8. Silverstein LH, Kurtzman GM, Moskowitz E, Kurtzman D, Hahn J. Aesthetic enhancement of anterior dental implants with the use of tapered osteotomes and soft tissue manipulation. J Oral Implantol 1999; 25(1): 18-22. Lee EA, Anitua E. Atraumatic ridge expansion and implant site preparation with motorized bone expanders. Pract Proced Aesthet Dent 2006; 18(1): 17-22. Nkenke E, Kloss F, Wiltfang J, et al. Histomorphometric and fluorescence microscopic analysis of bone remodelling after installation of implants using an osteotome technique. Clin Oral Implants Res 2002; 13(6): 595-602. Brägger U, Gerber C, Joss A, et al. Patterns of tissue remodeling after placement of ITI dental implants using an osteotome technique: a longitudinal radiographic case cohort study. Clin Oral Implants Res 2004; 15(2): 158-66. Siddiqui AA, Sosovicka M. Lateral bone condensing and expansion for placement of endosseous dental implants: a new technique. J Oral Implantol 2006; 32(2): 87-94. Flanagan D. Cortical bone spreader osteotome and method for dental implant placement. J Oral Implantol 2002; 28(6): 295-6. Skalak R, Zhao Y. Interaction of force-fitting and surface roughness of implants. Clin Implant Dent Relat Res 2000; 2(4): 219-24. Wilke HJ, Claes L, Steinemann S. The influence of various titanium surfaces on the interface shear strength between implants and bone. Adv Biomaterials 1990; 9: 309-11. Buser D, Schenk RK, Steinemann S, Fiorellini JP, Fox CH, Stich H. Influence of surface characteristics on bone integration of titanium implants. A histomorphometric study in miniature pigs. J Biomed Mater Res 1991; 25(7): 889-902. Buser D, Nydegger T, Oxland T, et al. Interface shear strength of titanium implants with a sandblasted and acid-etched surface: a biomechanical study in the maxilla of miniature pigs. J Biomed Mater Res 1999; 45(2): 75-83. Cochran DL. A comparison of endosseous dental implant surfaces. J Periodontol 1999; 70(12): 1523-39. Buser D, Mericske-Stern R, Bernard JP, et al. Long-term evaluation of non-submerged ITI implants. Part 1: 8-year life table analysis of a prospective multi-center study with 2359 implants. Clin Oral Implants Res 1997; 8(3): 161-72. Ferrigno N, Laureti M, Fanali S, Grippaudo G. A long-term follow-up study of non-submerged ITI implants in the treatment of totally edentulous jaws. Part I: Ten-year life table analysis of a prospective multicenter study with 1286 implants. Clin Oral Implants Res 2002; 13(3): 260-73. Nedir R, Bischof M, Briaux JM, Beyer S, Szmukler-Moncler S, Bernard JP. A 7-year life table analysis from a prospective study on ITI implants with special emphasis on the use of short implants. Results from a private practice. Clin Oral Implants Res 2004; 15(2): 150-7. Kubilius M, Kubilius R, Gleiznys A. The preservation of alveolar bone ridge during tooth extraction. Stomatologija 2012; 14(1): 3-11. Small PN, Tarnow DP. Gingival recession around implants: a 1-year longitudinal prospective study. Int J Oral Maxillofac Implants 2000; 15(4): 527-32. Koutouzis T, Koutouzis G, Tomasi C, Lundgren T. Immediate loading of implants placed with the osteotome technique: one-year prospective case series. J Periodontol 2011; 82(11): 1556-62. Demarosi F, Leghissa GC, Sardella A, Lodi G, Carrassi A. Localised maxillary ridge expansion with simultaneous implant placement: a case series. Br J Oral Maxillofac Surg 2009; 47(7): 535-40.